Decoration 2 full-page drawings in colours (f. 1r-1v). Numerous drawings in brown ink or with colours, on most pages, illustrating the Psalms. Large historiated initial in colours at the beginning of Psalm 1 (f. 2). Initials in red, green, or blue with penwork decoration, some with decoration in another colour or with animal heads. Small initials and rubrics in red. Spaces left for drawings and initials (ff. 36-49v). Decoration Added drawings in brown or in colours illustrating Psalms 52-62. Historiated initial in red (f. 29). Unfinished drawings (ff. 34v-35). Binding BM/BL in-house. Previous modern binding of brown leather with paper guards kept separately. Provenance Christ Church Canterbury: evidence of an initial with an archbishop wearing a pallium (f. 2); and by the script of one of the scribes (ff. 28-49v), identified by T. A. M. Bishop as being that of Eadui Basan, a Christ Church Canterbury scribe (see discussion Temple 1976); see also Noel 1995 pp. 2-3, who states that three of the artists or scribes can be identified as working on other manuscripts made at Christ Church; or the Benedictine abbey of St. Augustine, Canterbury (see Ker 1964). Perhaps commissioned by Aelfric, archbishop of Canterbury: he bequeathed it to Wulfstan, archbishop of York in 1003 or 1004 (see discussion Le Grand Atelier 2007). The Psalms are numbered according to the Latin Vulgate version of the Old Testament, which differs from the Hebrew and King James versions (for example, Psalm 23 in King James is Psalm 22 in the Vulgate). 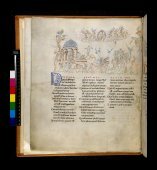 Although the illustration is copied from the Utrecht Psalter, the text is the Roman version except Psalms 100-105 which are Gallican (see Abbot Gasquet and Edmund Bishop, The Bosworth Psalter (London: Bell and Sons, 1908)). The decoration was left unfinished; space was left for drawings (ff. 36r-49v); and a sequence of coloured drawings was added in the 2nd quarter of the 12th century (ff. 29r-35r): see discussion Noel, 'Harley Psalter' (2009). Select bibliography A Catalogue of the Harleian Manuscripts in the British Museum, 4 vols (London: Eyre and Strahan, 1808-12), I, no. 603. M. Digby Wyatt, The Art of Illuminating (London: Dan and Son Lithographers, 1860; repr. Studio Editions, 1987), pp. 20-21. M. R. James, The Ancient Libraries of Canterbury and Dover (Cambridge, 1903), pp. lxix, 532. Abbot Gasquet and Edmund Bishop, The Bosworth Psalter (London: Bell and Sons, 1908), p. 8. Christopher Wordsworth and Henry Littlehales, The Old Service-Books of the English Church, 2nd edn (London: Methuen & Co., 1910), p. 114, pl. X.
J. A. Herbert, Illuminated Manuscripts (London: Methuen, 1911), p. 115. Schools of Illumination: Reproductions from Manuscripts in the British Museum, 6 vols (London: British Museum, 1914-1930), I: Hiberno-Saxon and Early English Schools A. D. 700-1100, pl. 11. Eric. G. Millar, English Illuminated Manuscripts from the Xth to the XIIIth Century (Paris: Van Oest, 1926), pl. 22. [Eric G. Millar], British Museum Reproductions from Illuminated Manuscripts, Series 4 (London: British Museum, 1928), pl. 5. Guide to an Exhibition of English Art gathered from Various Departments and held in the Prints and Drawings Gallery (London: British Museum, 1934. ), no. 82. Ernst Kitzinger, Early Medieval Art with Illustrations from the British Museum Collection (Bloomington: Indiana University Press, 1940), pl. 29(A). D. Talbot Rice, English Art 871-1100, Oxford History of English Art, 2 (Oxford: The Clarendon Press, 1952), pp. 182, 191, 201-2, pls. 65a, 66. Francis Wormald, English Drawings of the Tenth and Eleventh Centuries (London, 1952), pp. 30 ff., no. 34, pls 10b-12b, 25b, 35a. C. R. Dodwell, The Canterbury School of Illumination 1066-1200 (Cambridge: University Press, 1954), pp. 1-3, 27, 42, 47, 92, 122-23, pls. 1a-1c. T. S. R. Boase, English Art 1100-1216, Oxford History of English Art, 2 (Oxford: Clarendon Press, 1957), pp. 83, 158. Otto Pächt, C. R. Dodwell, and Francis Wormald, The St. Albans Psalter (Albani Psalter) (London: Warburg Institute, 1960), pp. 158 n. 1, 198. T. A. M. Bishop, 'Notes on Cambridge Manuscripts', Transactions of the Cambridge Bibliographical Society, 3 (1963), pp. 413-23. Hans Swarzenski, 'The Role of Copies in the Formation of the Styles of the Eleventh Century', in Studies in Western Art: Acts of the Twentieth International Congress of the History of Art, 4 vols (Princeton: Princeton University Press, 1963), I: Romanesque and Gothic Art, pp. 7-18 (p. 10). Francis Wormald, 'Late Anglo-Saxon Art: Some Questions and Suggestions', in Studies in Western Art: Acts of the Twentieth International Congress of the History of Art, 4 vols (Princeton: Princeton University Press, 1963), I: Romanesque and Gothic Art, pp. 19-26 (p. 21). Medieval Libraries of Great Britain: A List of Surviving Books, ed. by N. R.
Ker, 2nd edn, Royal Historical Society Guides and Handbooks, 3 (London: Royal Historical Society, 1964), p. 44. M. W. Evans, Medieval Drawings (London: Hamlyn, 1969), no. 19. A. Boutemy, 'Calendrier anglais illustré', Bulletin de la Société Nationale des Antiquaires de France (1970), 79-98 (p. 85). Lucy Freeman Sandler, 'Christian Hebraism and the Ramsey Abbey Psalter', Journal of the Warburg and Courtauld Institutes, 35 (1971), 123-34 (p. 125 n. 9). C. M. Kauffmann, Romanesque Manuscripts 1066-1190, Survey of Manuscripts Illuminated in the British Isles, 3 (London: Harvey Miller, 1975), no. 64, p. 97 [part 2]. Elzbieta Temple, Anglo-Saxon Manuscripts 900-1066, Survey of Manuscripts Illuminated in the British Isles, 2 (London: Harvey Miller, 1976), no. 64, pp. 22, 61, 75, 86, 90, 92, 94, 100-2, 114, 116. Janet Backhouse, The Illuminated Manuscript (Oxford: Phaidon, 1979), fig. 6. Dorothy Mahoney, The Craft of Calligraphy (London: Pelham Books, 1981), pl. on p. 71. Anne Lawrence, ‘Manuscripts of Early Anglo-Norman Canterbury’, in Medieval Art and Architecture at Canterbury before 1220, ed. by Nicola Coldstream and Peter Draper, British Archaeological Association Conference Transactions, 5, 1979 (Leeds: Maney and Son, 1982), pp. 101-11 (pp. 102, 105). Janet Backhouse, 'The Making of the Harley Psalter', British Library Journal, 10 (1984), 97-113. The Golden Age of Anglo-Saxon Art 966-1066, ed. by Janet Backhouse, D. H. Turner, and Leslie Webster (London: British Museum, 1984), no. 59, pl. XIX [exhibition catalogue]. Otto Pächt, Buchmalerei des Mittelalters (Munich: Prestel, 1984), pl. 18. François Avril and Patricia Danz Stirnemann, Manuscrits enluminés d’origine insulaire VIIe-XXe siècle (Paris: Bibliothèque nationale, 1987), p. 47. Michelle Brown, Anglo-Saxon Manuscripts (London: British Library, 1991), p. 75, pl. 73. Jonathan J. G. Alexander, Medieval Illuminators and their Methods of Work (New Haven: Yale University Press, 1992), pp. 73, 76, 101, 144, fig. 121. William Gerard Noel, 'The Making of B. L. Harley Mss. 2506 and 603' (unpublished doctoral dissertation, Cambridge University, 1992) [with additional bibliography]. Thomas H. Ohlgren, Anglo-Saxon Textual Illustration (Kalamazoo: Medieval Institute Publications, Western Michigan University, 1992), no. 2, pp. 1-2, 18-41, pls 2.1-2.102 [black and white images of all of the illustrations]. C. R. Dodwell, The Pictorial Arts of theWest 800-1200 (New Haven: Yale University Press, 1993), pp. 100-1, 103, 117-18, 338, 415, pls 83, 87. Richard Gameson, 'The Romanesque Artist of the Harley 603 Psalter', English Manuscript Studies 1100-1700, 4 (1993), pp. 24-61. Michelle P. Brown, Understanding Illuminated Manuscripts: A Guide to Technical Terms (London: British Library, 1994), pl. on p. 92. William Noel, ‘The Division of Work in the Harley Psalter’, Making the Medieval Book: Techniques of Production, ed. by Linda L. Brownrigg, Proceedings of the Fourth Conference of The Seminar in the History of the Book to 1500, Oxford, July 1992 (Los Altos Hills, California: Anderston-Lovelace, 1995), pp. 1-15. Carl Nordenfalk, Book Illumination: Early Middle Ages (Geneva: Editions d'art Albert Skira, 1995; originally printed as Early Medieval Painting, New York: Skira, 1957), p. 104. Richard Gameson, ‘Book Production and Decoration at Worcester in the Tenth and Eleventh Centuries’, in St Oswald of Worcester: Life and Influence, ed. by Nicholas Brooks and Catherine Cubitt, Studies in the Early History of Britain, The Makers of England, 2 (London: Leicester University Press, 1996), pp. 194-243 (p. 201). William Noel, The Harley Psalter, Cambridge Studies in Palaeography and Codicology (Cambridge: Cambridge University Press, 1996). 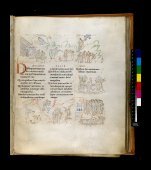 The Utrecht Psalter in Medieval Art: Picturing the Psalms of David, ed. by Koert van der Horst, William Noel, and Wilhelmina C M. Wüstefeld (Utrecht: HES Publishers, 1996), no. 28, and esp. pp. 151-53. Janet Backhouse, The Illuminated Page: Ten Centuries of Manuscript Painting in the British Library (Toronto: University of Toronto Press, 1997), no. 12. Michelle P. Brown, 'Sir Robert Cotton, Collector and Connoisseur? ', in Illuminating the Book: Makers and Interpreters, ed. by Michelle P. Brown and Scot McKendrick (London: British Library, 1998), pp. 281-98 (p. 286). Helmut Gneuss, Handlist of Anglo-Saxon Manuscripts: A List of Manuscripts and Manuscript Fragments Written or Owned in England up to 1100, Medieval and Renaissance Texts and Studies, 241 (Tempe: Arizona Center for Medieval and Renaissance Studies, 2001), no. 422. Diane Reilly, ‘French Romanesque Giant Bibles’, Scriptorium: Revue internationale des études relatives aux manuscrits, 56 (2002), 294-311 (p. 294 n. 1). Michelle P. Brown, Painted Labyrinth: The world of the Lindisfarne Gospels (London: British Library, 2003), p. 46. Celia Chazelle, ‘Violence and the Virtuous Ruler in the Utrecht Psalter’, in The Illuminated Psalter: Studies in the Content, Purpose and Placement of its Images, ed. by F. O. Büttner, (Belgium: Brepols, 2004), pp. 337-48 (p. 344 n. 32). The Cambridge Illuminations. Ten Centuries of Book Production in the Medieval West, ed. by Paul Binski and Stella Panayotova (London: Harvey Miller, 2005), p. 63. Jane Geddes, The St Albans Psalter: A Book for Christina of Markyate (London: British Library, 2005), pp. 75, 81, fig. 64b. Treasures of the British Library, ed. by Nicolas Barker and others (London: British Library, 2005), p. 53. Asa Simon Mittman, Maps and Monsters in Medieval England (New York: Routledge, 2006), p. 150, pl. 8.2. Michelle P. Brown, Manuscripts from the Anglo-Saxon Age (London: British Library, 2007), pls 124-25. The Grand Atelier: Patheways of Art in Europe (5th-18th Centureis), ed. by Roland Recht (Brussels: Europalia, 2007), no. II.8 [exhibition catalogue]. George Henderson, 'On Making Medieval Illuminated Manuscripts Accessible', in The Cambridge Illuminations: The Conference Papers, ed. by Stella Panayotova (London: Harvey Miller, 2007), pp. 13-19 (p. 15). Scot McKendrick and Kathleen Doyle, Bible Manuscripts (London: British Library, 2007), pp. 58-59, figs. 45-46. Sacred: Judaism, Christianity, and Islam and their Sacred Texts (London: British Library, 2007), p. 122 [exhibition catalogue]. T. A. Heslop, ‘The Implication of the Utrecht Psalter in English Romanesque Art’, in Romanesque: Art and Thought in the Twelfth Century: Essays in Honor of Walter Cahn, ed. by Colum Hourihane, Index of Christian Art Occasional Papers, 10 (Princeton: Index of Christian Art, 2008), pp. 267-90 (pp. 270-72, 279-81, figs 7, 8). Michelle P. Brown, 'An Early Outbreak of "Influenza"? Aspects of Influence, Medieval and Modern", in Under the Influence: The Concept of Influence and the Study of Illuminated Manuscripts, ed. by John Lowden and Alixe Bovey (Turnhout: Brepols, 2008), pp. 1-10 (pp. 4-5). Joe Flatman, Ships and Shipping in Medieval Manuscripts (London: British Library, 2009), pl. 36. William Noel, 'The Harley Psalter', in Melanie Holcomb, Pen and Parchment: Drawing in the Middle Ages (New York, Metropolitan Museum of Art, 2009), fig. 9, pp. 13-14, no. 12 [exhibition catalogue].